← Could it be the Snow? Comments: Tasted just as good warmed up today as it did yesterday. Hardest Part: Finding products that were not packaged in plastic! Both Garden Cove and Earth Fare carry an extensive variety of unsweetened coconut products, but neither carries products in the bulk bins. The Native Forest coconut milk is in a BPA-free can. Comments: I’ve already started using coconut in my cooking. Please see previous blog posts for examples. My husband loves coconut in all its forms, so this is a welcome addition to our diet. I also went to see my chiropractor, Curt Summers at Jones Valley Chiropractic. I highly recommend seeing him if you have back pain. He sees a lot of the local runners, so he is familiar with sports injuries as well as the usual back problems. He doesn’t try to get you to come in 3x a week for the rest of your life, and he’s really good about working me in when I realize I can get away at the last minute. 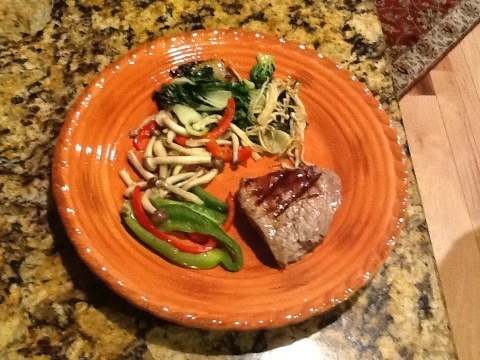 That’s a tenderloin steak with sauteed baby bok choy, Chinese mushrooms and bell peppers. The steak tasted like I remember steak tasting as a kid. I also brought over the Cocoa nut pie for dessert, which was a hit with Mom and Dad as well. After dinner we played Mah Jongg and then Dad and I hung out and discussed our blogs (well, of course I had to get my iPad out for that…). Social Circle connections: I texted one of my girlfriends that I haven’t done anything with in awhile to see if she could do anything today, but she was unavailable, so we are planning to get together another day soon. This afternoon I texted (we would have talked, but there were barriers to that) another girlfriend for about an hour while I rested my back. I also hope to go for a walk with a girlfriend this weekend if my back continues to improve. Hardest part: I really need to make sure I read these challenges in advance so I can plan better. I am terrible about neglecting my social life with friends. My family and my job are both so busy that I’ve gotten out of touch with most of my friends. I used to see many of my friends at races, runs, bike rides, etc., but since I’ve been injured I’m not attending those events anymore. Best part: It really does help my mood to have contact with friends and family. Elements to integrate into lifestyle long-term: prioritize real communication with friends and family over social networking and forums. Comments: I noticed today, since it was another social media fast day, how much time I usually spent in this manner when I’m not at work. 8 Responses to Going Coco-nuts! Glad you are noticing improved energy. I’m feeling more energetic most days as well, today is a med adjustment. 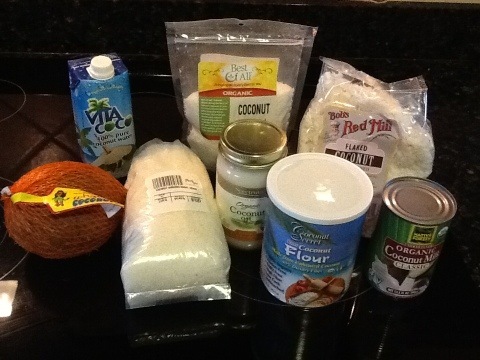 You can order coconut products online as well. I can get you a discount code to vitacost, which is where I purchased some of the products. “Rain for hydration” … love it! Oh, a little honey is fine. Hey, better to have a glass of iced tea with a little honey than a diet Coke, right? When T had gum surgery I remember scouring the pantry for something with caffeine in it that he could tolerate! I’ll e-mail you the coupon code. It was! Everyone thinks that their mom is the best cook in the world, but my mom actually IS the best cook in the world. She also made fettucine alfredo last night for the kids, just so they’d have another side dish! Thanks, Jen. I do love to cook and eat and try new foods. The variety of fresh mushrooms from the Chinese grocer was one of my highlights of the week. So much to discover.